I love to travel, but sometimes it's just not possible to jump on a plane and leave the world behind for a week or three. That's when I start planning for a foreign vacation right in my own back yard, with rosé chilling in a tub in the dappled sunlight beneath our oak tree and myriad plates of tapas like this one from contributor Jim Dixon of Real Good Food. These are often served with drinks as a petisco, the Portuguese version of a tapa. Cut three or four carrots into roughly half inch slices (I split them lengthwise, then slice crosswise) and cook them in well-salted boiling water for about 10 minutes. You want them just barely tender, not soft. 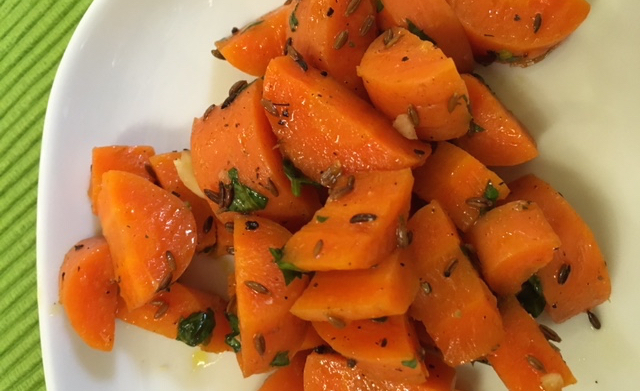 While the carrots cook, make the marinade by stirring together a tablespoon of honey or sugar with a couple of tablespoons of Katz Sparkling Wine vinegar [regular white wine vinegar works, too], then adding four tablespoons of extra virgin olive oil. Toast a couple of tablespoons of cumin seeds in a dry skillet for a few minutes until they're aromatic and just starting to brown.